The Kodak Signet 80 was the last and most sophisticated camera in Kodak's Signet line. It is an interchangeable lens 35 mm rangefinder camera produced from 1958 to 1962 by Kodak in the USA. The body, constructed of die-cast metal and (mostly) Bakelite, has a coincident coupled rangefinder combined with a very nice life-sized projected frame viewfinder. The camera has a synchronized behind-the-lens leaf shutter in a unique scissors lock lens mount. Two of the three Signet 80 lenses, the 50mm and 90mm, contain thorium oxide, and are somewhat radioactive. 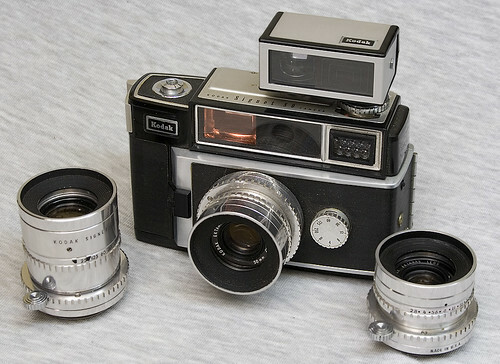 This was Kodak's second attempt at an American-made camera system, the first being the Ektra. The Signet 80 was targeted at the photography enthusiast and is capable of taking high quality photographs. It originally sold for $130 USD , about $950 USD in 2007. For reference, this was about 75% of the cost of a Retina IIIC, the most comparable German Kodak camera of that era. Unfortunately, quality of the Signet's materials and construction are significantly lower than the Retinas and it has reliability issues. It was never a really successful product and production was terminated after just four years. LENSES are removable as a complete unit to substitute wide-angle or telephoto lens. 50mm, f/2.8 Kodak Ektanar, Lumenized. Standard Lens. LENS OPENINGS-Marked in EVS - 5 to 17, as well as f/numbers - 2.8 to 22. Uses Series 5 filters. 35mm, f/3.5 Kodak Ektanar, Lumenized. Wide Angle Lens LENS OPENINGS-Marked in EVS - 5 to 17, as well as f/numbers - 3.5 to 22. Uses Series 5 filters. 90mm, f/4.0 Kodak Ektanar, Lumenized. Telephoto Lens LENS OPENINGS-Marked in EVS - 6 to 17, as well as f/numbers - 4.0 to 22. Uses Series 5 filters. SPEEDS - 1/4, 1/8, 1/15, 1/30, 1/60, 1/125, 1/250 and "B"
RELEASE - Plunger-type-with cable release socket located on right top of camera. FLASH - Built-in synchronization for class F, M, and electronic flash. Flash receptacles on camera body accept Kodalite Super-M 40 Flasholder, Kodak Rotary Flasholder, Type 1, and Kodak Generator Flasholder, Type 1. Accessory shoe and PC socket for electronic and other flashes. Uncoupled Selenium Cell, built-in. Reads reflected and incident light in EV numbers. Film speeds from 10 to 6400 ASA. Unique "injection" film-loading-with leader windoff. Rapid 2-stroke film advance right side of camera. Rewind crank on right bottom of camera.